After Conflict-Of-Interest Flap, No China Meetings For Kushner Companies This Weekend : The Two-Way A pitch by Jared Kushner's sister to Chinese investors last weekend drew questions over whether the family company was capitalizing on connections to the White House. This weekend, they're lying low. 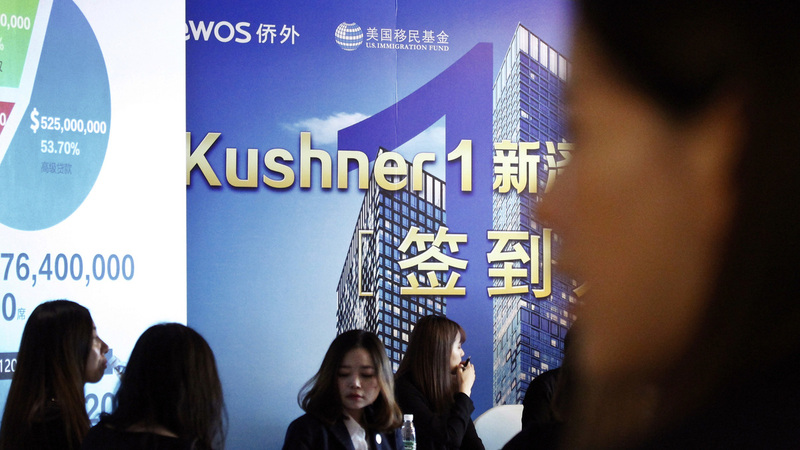 Chinese staff wait for investors at a reception desk during an event promoting a Kushner Companies development in Shanghai on Sunday. Nicole Kushner Meyer, sister of Jared Kushner, has canceled an upcoming presentation that had been scheduled for Saturday in Shenzhen. Just days after her comments to Chinese investors set conflict-of-interest questions swirling, Jared Kushner's sister will not be holding a similar presentation that had been scheduled for Saturday. Nicole Kushner Meyer, who has been in China courting investors interested in the family firm's stateside real estate development, had drawn significant criticism for mentioning her family's White House connections in a pitch last weekend. As NPR's Rob Schmitz reports, Meyer had been scheduled to deliver a presentation in the southern city of Shenzhen, seeking to sell Chinese investors on the EB-5 visa — a controversial federal program that offers a path to permanent residence for investors who create at least 10 full-time jobs for U.S. workers. But The Washington Post reports that now there will be no meetings for Kushner Companies in China this weekend, citing a company spokeswoman. "The controversy began when reporters from The Washington Post and The New York Times sat in on a publicly advertised event at the Ritz-Carlton Hotel in Beijing on Saturday. "And the pitch came with a sweetener: Meyer talked about the Kushner family, including her brother who holds a powerful position in the White House as senior adviser to President Trump." Critics saw the comments as an abuse of the Meyer's relationship with Kushner — and, in turn, with Kushner's father-in-law, President Trump. Rob notes that Meyer later apologized for mentioning her brother at the event.